Mavi Marmara justice grinds slowly, but grinds exceedingly fine. I am in Istanbul and tomorrow, Dec. 9th, I will attend the on-going trial of the 4 Israeli generals who were responsible for the May 2010 attack on the Mavi Marmara and the Freedom Flotilla. They are being tried for the murder of 10, wounding of 155, and the kidnapping, brutalization and torture of over 700 civilian aid workers, while they were in international waters, trying to take humanitarian aid to Gaza. The Turkish court has already issued arrest warrants for the generals, and will eventually ask the worldwide Interpol police force to find them and extradite them to Turkey to stand trial for murder, kidnapping and torture. Then these war criminals will have to be constantly looking over their shoulders when ever they travel. The time is coming when they, and Israel, will have to face justice for all the crimes they have committed. When I complained to my Canadian government about what the Israelis did to me on the Mavi, (assault, attempted murder, kidnapping and theft of $4000 cash etc etc), the Federal Foreign Affairs department told me to fly to Israel, go to the nearest Israeli police station and file a complaint report with them! Not very helpful advice to say the least, especially as I am banned for life from Israel by their wonderfully democratic government. 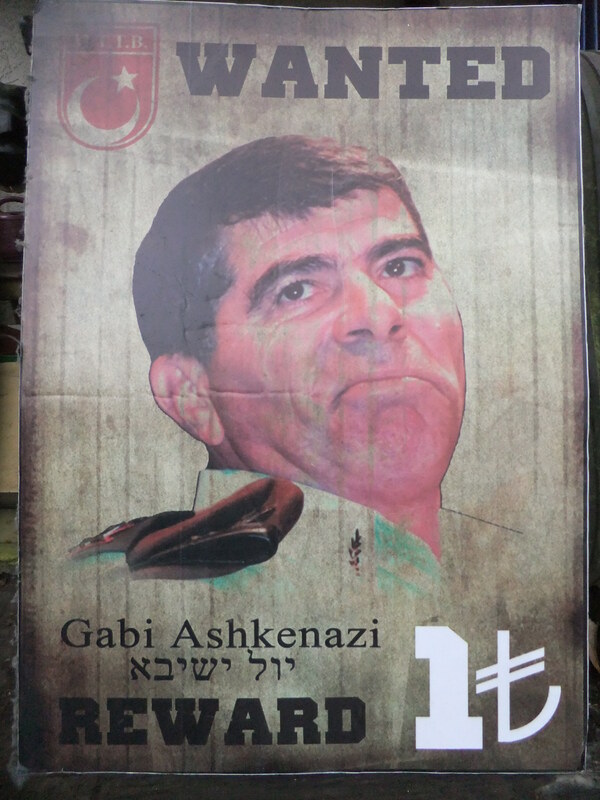 Below is a “wanted” poster from the streets of Istanbul, for Israeli General Ashkenazi (the Hebrew name is for the wrong general and it’s reversed…printer error!). I guess with a reward of only 1 lira, they feel that they don’t need to offer much of an incentive to get them all captured and sentenced.